And the results of the Frame the Star contest with Mercedes-Benz India are out. If you've been following OVERDRIVE over the last few months, you'll know we got some of the most promising photographers to capture the CLA at three exotic locations  Chikmagalur, Naldehra and Jaipur. And as with all things OVERDRIVE, the stakes were high too - the chance to drive home a Merc CLA for an entire year. The panel of judges comprised of ace photographer Swapan Parekh and Ideas@Work founder Prashant Godbole. Choosing between the three finalists  Kevin Nunes, Raju A Khokale and Altaf Khan was no easy task  with each of them photographing the CLA in their own distinctive styles. They made full use of mountain roads, plantations, hillside cottages and whatever the road threw at them for backdrops and the proceeded to apply their own brand of magic to these photographs. 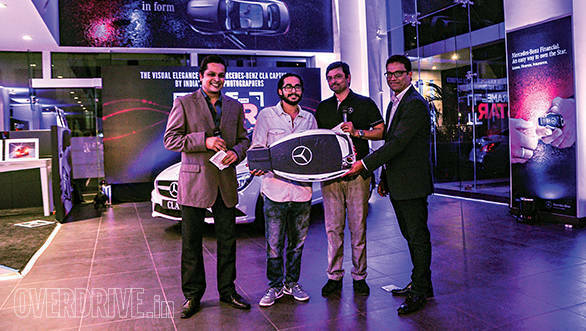 Finally it was Kevin Nunes who bagged the keys to the CLA for a year. The judges (and we here at OVERDRIVE) were quite taken with his beautiful frames. His vibrant use of bokehs and multiple exposure to capture, not just the body of the car, but also the interior was what really caught our eye. Finalist Raju A Khokale's images, meanwhile, had this potent quality that really did justice to the dynamics of a car like the CLA. Case in point - a photograph of the CLA welcoming an oncoming storm with its doors open. In print, the scene is just about perfect. The other finalist, Altaf Khan used his background in advertising to come up with a picture that really brought out the 'star' in Frame the Star. Look out for all these gorgeous pictures in the September issue of OVERDRIVE.